Cable Jungle? It’s a NO-NO! 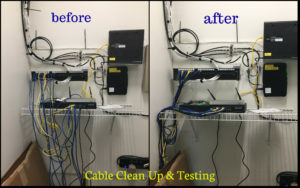 Have you been working in an office and seeing your PCs, telephone wires, network cables unorganized, messy and unlabeled? Was it a distraction in some ways and an eye sore? If your answer is YES, it is time for you to get out of that situation and work in a neat and orderly environment. We have listed below the disadvantages and advantages of it. •	Inconvenient – Every time you need to go behind your PC, TV or other equipment that has cables or wires unlabeled and untidy, you can’t immediately cross or get what you need behind those equipment. •	Fire and Electrical hazard – When you add another cable or wire from the existing line connection a possibility of electrical shortage is at stake if cables and wires are not properly attached and tidy. •	Accidental Power shut off – If there are couple of knots and tangles around and you hit one wire, power shut off may accidentally occur. •	Audio and Video malfunction – This is happening mostly in TVs and media players. If cables behind them are not organized, an interference in display and sounds will most likely happen. •	Cost efficient – When your cables and wires are organized and neat there would be no chance of power tripping which means there are no unnecessary expenses to fix or buy new equipment. •	Good electrical consumption – If your cables and wires are properly attached and there are no broken wires due to tangle the flow of electricity will not be interrupted. •	Space friendly – Need not to worry if your office has a small space for much equipment as long as cables are clean, tidy and labeled. AT JCCHelp, we will take care of your cabling needs. You will no longer suffer in unorganized and lousy cables but instead a comfortable working environment is what we promised! Contact US now at (412) 853-3708 / info@JCCHelp.com and talk to our professionals immediately.